Co-owners Josh and Adam Davis continue their involvement with the local community and charity. 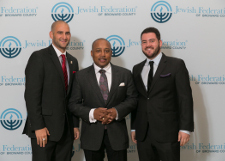 The Jewish Federation of Broward County held their annual Men's Night Out and this years speaker was Daymond John, seen on the television show "Shark Tank," which drew 500 people to the event that took place recently at the Signature Grand in Davie. John is also the founder of the FUBU (For Us By Us) clothing line that is distributed to stores across the country and in many countries around the world. Josh and Adam pose with John after a meet and greet.